Heads up! Make sure that the XBees are configured correctly to communicate with each other in the network. Before continuing with this example, you'll need to make sure your XBee's are configured correctly -- they need to be on the same network and have compatible destination and MY addresses. By default, XBees will all be compatibly configured, but we recommend setting up unique network ID's and addresses. Check out the Configuring Networks page of our Exploring XBee's and XCTU tutorial for help with that. This example assumes you have XCTU installed and two compatibly-configured XBees -- one connected to your computer via a USB Explorer (or Dongle, or Serial Explorer) and another plugged into the Shield/Arduino. Let&apos;s start simple. In this section, we'll upload a sketch which passes data between your serial monitor and the XBe using the serial UART. This sketch can be use to create a "portal of communication" between your Arduino's serial monitor, and another XBee (connected to a computer via a USB Explorer). The first uses software serial defined pins on an Arduino. The second example uses the native hardware serial defined pins. Here's the sketch we'll use. It makes use of the SoftwareSerial library, which is included with all of the recent Arduino releases. Before uploading this sketch, make sure the switch on the Shield is in the "DLINE" position! Copy and upload the sketch below. 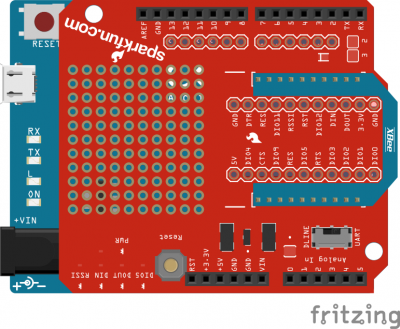 the XBee's DOUT and DIN pins to Arduino pins 2 and 3. The demo code was originally designed for the ATmega328P on the Arduino Uno. Not all the pins can support change interrupts for a serial Rx pin depending on what Arduino microcontroller is used. If you were using it with ATmega2560 (i.e. Arduino Mega 2560) or ATmega32U4 (i.e. Arduino Leonardo, Pro Micro 5V/16MHz, Pro Micro 3.3V/8Mhz, FioV3, etc. ), you would need to re-define the software serial pin definitions, remove the solder jumpers for pin 3 & 2, and reroute the pins. For more information about the limitations, try looking at the Arduino reference language for the Software Serial library. To reroute the pins, on an Arduino Mega 2560 or Leonardo, you would need to remove the solder jumper and reroute pads to the respective pins. Warning for Users NOT Using the Arduino Serial Monitor! If you are using Digi's X-CTU or a serial terminal to configure or connect to an XBee by using a RedBoard/Arduino Uno as a serial passthrough, you may need to add a jumper wire between the RST and 5V pin to prevent the Arduino from resetting. Basically when the XCTU or serial terminal opens a COM port to the Arduino, computer resets the microcontroller while looking for the XBee. Therefore, it can’t communicate with the XBee because the Arduino is rebooting. 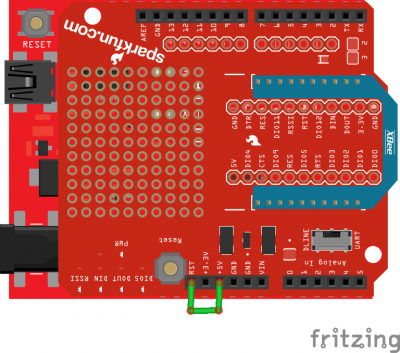 This example is for those trying to use the hardware UART on an ATmega32U4-based Arduino. Copy and upload the sketch below. You can also download it here. 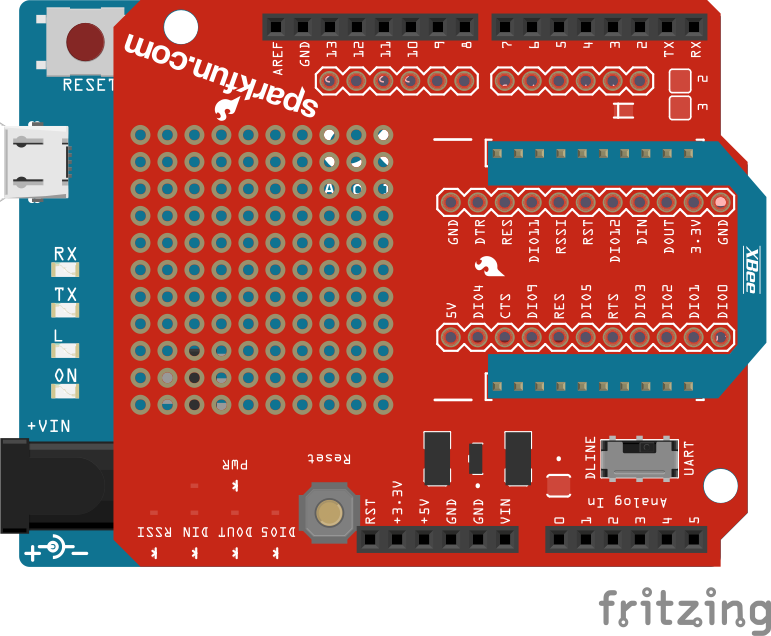 the XBee's DOUT and DIN pins to Arduino pins 0 and 1. Note: If you are using an Arduino Leonardo (or any ATmega32U4-based Arduino) and not a Arduino Uno, make sure to change the switch to the hardware "UART" position. In this case, do not need to add a jumper wire between the RST and GND pin. Open the Arduino's Serial Monitor. Make sure the baud rate is set to 9600. Switch to XCTU and click over to console mode. Type something in the console view, it should show up on the Serial Monitor. Type something into the Serial Monitor (and press "Send"), it should show up in the console view. You can use this setup to create a chat system. If you have another computer nearby, try to see how far your XBees can be from each other while still reliably communicating. If your XBee's aren't communicating with each other, try getting them closer together (if they were far apart to begin with). Otherwise, check out our troubleshooting section of the Exploring XBee tutorial.